Dr. Joan Iversen was my mother — She was a small, energetic woman with a formidable presence in the world; she was a force of nature. A passionate, gifted teacher and a feminist, long before most people were willing to wear that label. Because it was so important to her to shape the future, I, with support from family, her friends, her former students and colleagues have set up a scholarship in her name at the college where she was on faculty, The State University of New York at Oneonta, until her retirement in 1993. She was widely known as an outstanding teacher, culminating in her receiving the State University of New York Chancellor’s Award for Excellence in Teaching in 1973. 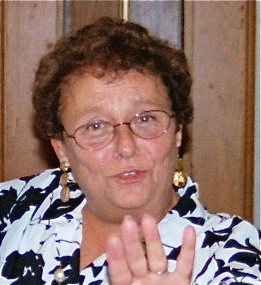 She served as history department chair from 1987-1990. My mom was a champion of women’s rights and the study of women’s history. She was the founder and chair of the SUNY-Oneonta Women’s Studies program from 1975-1979, and a founding member and vice-president of the Delaware/Otsego Chapter of the National Organization for Women. She was also founder and chair of the Oneonta Battered Women’s Project in 1978, which is now the Violence Intervention Program of Opportunities for Otsego. Her research focused on the feminist implications of Mormon polygyny and her book, The Antipolygamy Controversy in U.S. Women’s Movements, 1880-1925, A Debate on the American Home, continues to be a key resource on this topic. What: An endowed scholarship created through the gifts of family, colleagues, friends and alumni in memory of Dr. Joan Iversen, Professor of History at SUNY Oneonta from 1967-1993, who worked to establish the Women’s Studies program at the college and served as its first chair. This scholarship became endowed when it reached a principal amount of $25,000. This occurred in May 2014, so we are now building the scholarship so that it can provide more support to a Women’s and Gender Studies student. Awarded to: Undergraduate students who have financial need and who have declared a minor in Women’s and Gender Studies (or a major, should one become available in the future), and whose experience or interests reflect a commitment to feminism/feminist studies/women’s rights. In the event that Women’s Studies or Gender Studies is no longer a program at the college, the scholarship will be made to students who have financial need and whose experience or interests demonstrate a commitment to feminism/feminist studies/women’s rights. Help build a scholarship that honors and continues her legacy, growing through gifts from all the people whose lives she touched. With every gift, each donor is giving the future a part of what they received from Joan Iversen. I was a student of Dr. Iversen in Ossining High School and loved her very much. When she came to Ossining High School she taught 7th grade history, english and math. I was in that 7th grade class and it was also my first year at Ossining High School. I invited her to have dinner at my home and she so kindly accepted. We had a wonderful evening. I again had her for history in the 9th grade. She was also our class advisor(class of 1959). We were all sad to see her leave. I have thought about her often. Just yesterday, I mentioned to my cousin she was my favorite teacher and then decided to see if I could locate her. Sorry to read of her passing but was very pleased to see what a wonderful life she had and how much she had helped women. Joan, thank you so much for sharing your experiences with my mom! I laughed out loud when I heard she had taught math to you in 7th grade (math wasn’t her strongest subject later in life). I’m so touched by the memories you’ve shared, thank you. I think at some point I will put your comment into an actual post on this blog, so more people can enjoy this glimpse into my mom’s early life as a teacher. Nancy, I had a couple of opportunities to visit the Alumni brick garden this weekend. Ii had a great visit with Joan and Jack. Several of the guys and I had a good chuckle revisiting the location of the Joan “keggers ” And everybody always speaks of her amazing teaching and reaching. I’m so glad you had a great alumni weekend and had a chance to visit my parents at those bricks! It was so sweet of you to remember them that way. Joan – in 1972 I was a freshman at Oneonta and new history major. 45 years later I am still a student of history and your mother is a major reason for that. She was the most engaging and compelling professor of any subject I had at Oneonta and the only one I remember so many years later. I never knew about her focus on feminist studies and women’s development though your description of her as a champion in that area is not surprising. My own mother was a feminist before the word had any meaning and I think that my own consciousness of my mothers life and struggle as a single professional woman on the 69’s and 70’s created an unconscious(?) connection with your mom. I am committed to handing down my love of history to my now 7 year old grandson and sharing a story about your Mom. Thanks for sharing her life with all of us who benefited from her example. Charles, thanks so much for sharing the influence of my mother’s teaching on your love of history. It feels wonderful to know that her passion for history lives on in your life (and, then in your grandson’s life! ), and in all the lives of her students.